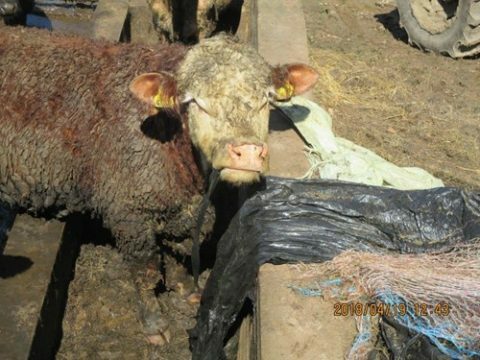 Keith Barber of Joys Green, Lydbrook also pleaded guilty to one offence relating to the dirty conditions of the feeding troughs, two offences relating to the disposal of animal carcases and four offences under the Cattle Identification Regulations. He was sentenced to 18 weeks in prison suspended for two years and ordered to pay £2,500 towards prosecution costs and a victim surcharge of £115. He was also disqualified from keeping pigs and cattle for ten years. When passing this sentence, the magistrates said Mr Barber had a “cavalier attitude towards the welfare of his animals”. Cllr Dave Norman, cabinet member responsible for trading standards, said, “Gloucestershire Trading Standards inspectors and most responsible farmers take pride in maintaining animal welfare standards in the county. It is so essential to make sure the integrity of the human food chain is maintained by farmers correctly identifying their cattle, as well as making sure that all animals are well looked after. In this case Mr Barber has failed in his duty of care to his animals, despite receiving advice from Trading Standards, leaving us with no option other than to prosecute”. In April 2018, animal health inspectors from Gloucestershire County Council Trading Standards Service visited Mr Barber’s farm in the Lydbrook area of the Forest of Dean after a tip off from a member of the public. They discovered that cattle and pigs were being kept in unsatisfactory conditions. Officers found some of the cows had extensive hair loss and many were very thin. A dead calf and dead pigs were also found on the premises, and officers were particularly concerned that one pig carcase had been there for so long that only the skeleton remained. Cattle were housed in sheds with deep muck and there was nowhere dry for them to lie down. They were also seen eating plastic wrapping from their fodder when no other food was available. When food was provided space at the trough was insufficient and cattle were seen jostling each other as they fought to get to the feed. Sows and piglets were kept in a shed with high ammonia levels and had no access to clean drinking water and other pigs had no water or dry lying area. As a result of what they found, Trading Standards officers called vets from Animal Plant Health Agency (APHA) and returned to the premises the following day. Mr Barber was advised by the APHA vet of the actions he needed to take to make sure that the welfare needs of his animals were met. Over the following months an APHA vet and a Trading Standards Inspector visited the premises to check the welfare of the animals. Although limited improvements were made to reduce the ammonia levels in the sow shed, on many occasions animals were found without any access to a dry lying area, pigs were found without access to water, and in pens which were smaller than the minimum requirements. This was a breach of animal welfare legislation. Mr Barber also failed to apply ear tags to calves within 20 days of their birth, despite being advised on a number of occasions by Trading Standards that this was a legal requirement and vital to ensure consumer confidence in British beef and the integrity of the human food chain. Mr Barber had previously received advice from Gloucestershire Trading Standards regarding the need to care for his animals and the fact that the poor drainage at the site made some of his sheds unsuitable to house livestock. He had also previously signed a formal caution in relation to failing to identify calves born on his holding within the required time limits. Members of the public who want to report concerns about animal welfare standards in the county, or other potential breaches of trading standards regulations, are encouraged to contact the trading standards helpline 03454 040506.